This is my answer to the question over on Quora, What is the neurological definition of sleep? Sleep has a common, folk definition (the one we all know) which is roughly a state of reversible unconsciousness. 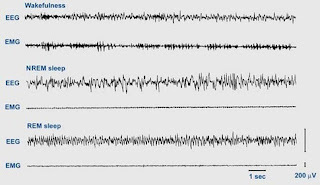 Neurologically speaking, sleep is generally defined by macroscale features of the surface EEG. 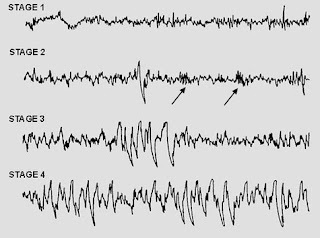 In other words, doctors put passive recording electrodes on your head to record the average electrical activity of millions of neurons to see if there's neural evidence for "wakefulness", drowsiness, or the various stages of sleep. While this can be done algorithmically via a computer these features are usually pretty easy to spot by eye. 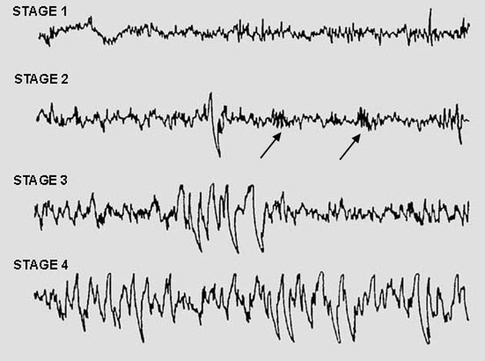 As sleep progresses the brain is said to increasingly "synchronize", meaning large groups of neurons begin firing at around the same times in a periodic fashion, which causes those oscillating peaks/troughs seen in Stage 4 sleep above. This occurs up to the point of rapid eye movement (REM) sleep, which is the stage of "active" sleep, which we call dreaming. While during the other stages of sleep we're unconscious, we're debatably not unconscious during REM, though our bodies are atonic. "Atonic" means "without tone", meaning a lack of muscle tone, meaning our bodies have gone limp. 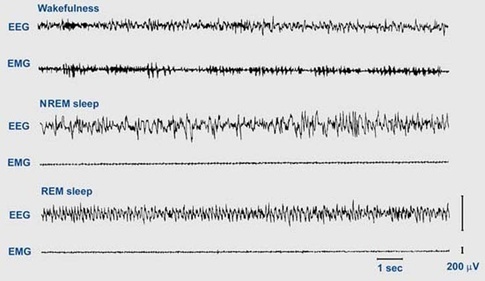 In fact, for neuroscientific sleep research scientists record muscle activity along with neural activity to help differentiate between wakefulness and sleep because the rough EEG looks fairly similar between the two states. 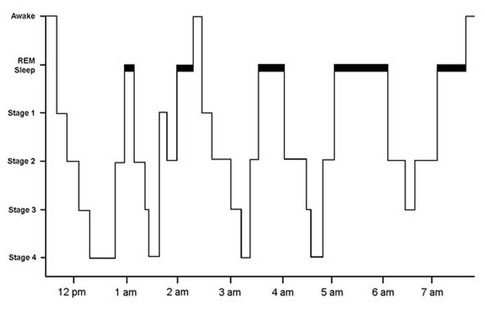 During a standard night's sleep we move back and forth between these different stages many times, often briefly revisiting an awake stage (though we may not remember it). There are some who argue that our society's current habit of sleeping in one 6-10 hour stretch is a relatively modern construction. 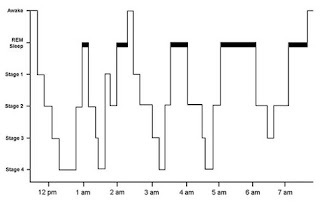 The fact that our sleep/wake cycle seems to occur on a fairly regular 24-hour cycle led many to suppose that over evolution the light/dark cycle caused by the sun shaped our biology. In the 1970s scientists discovered a gene in fruit flies (Drosophila melanogaster, a common organism used in genetic research) dubbed "Period", which is thought to be the gene controlling the underlying molecular mechanism for this 24-hour cycle (called the circadian rhythm). An analogous gene called CLOCK was then discovered in mammals in the 1990s. 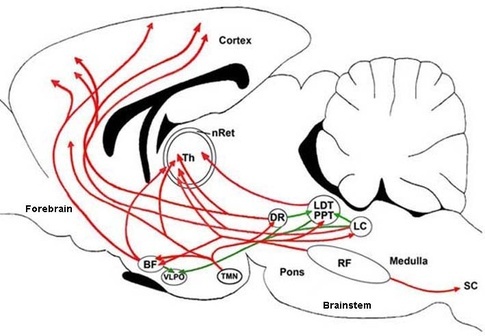 Okay, but what's happening in the brain during sleep? Unsurprisingly it's complicated, but very simplistically neurons in the brainstem that form what's called the "ascending activating system" actively help maintain the neural systems for maintaining conscious (which is why a blow or damage to the brainstem can cause unconsciousness or coma). During sleep, activity in this activating system slows and consciousness-supporting neural activity decreases. 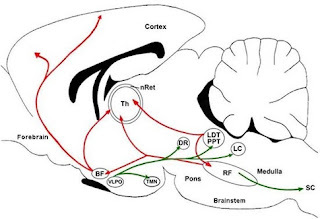 The hippocampus is essential for encoding self-experienced events into memory. 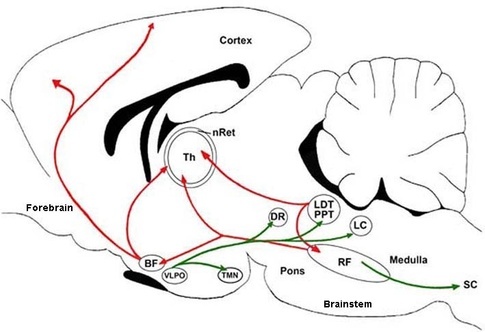 During sleep, neural activity in the hippocampus related to a recent experience has been observed to spontaneously reoccur, and this 'replay' has been postulated to be important for memory consolidation. Our brains are never totally quiet! Amazingly, certain animals such as the cetaceans (like dolphins) never seem to be "fully" asleep. These animals have to continually resurface in order to breathe. But they also don't not sleep... it just appears as though they "rest" half their brains at a time. Wow after writing this summary, I kind of regret not getting into sleep research. This stuff is really cool.